Star Physio’s Principal Physiotherapist and leading Bikefit clinician Damian Oldmeadow will be at the York Cyclo-Sportif this weekend. If you have any niggles or injuries or would just like a bit of advice on Bikefit or anything cycling health related, come over and say “Hi”! Star Physio is proud to sponsor BWA and continues to offer discounted physiotherapy treatment and classes to all BWA members. 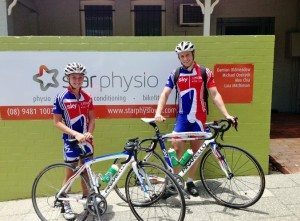 We have worked with some of the best cyclists in the world including the British Cycling Team (Olympic Gold Medallists Jason Kenny and Laura Trott pictured outside our West Perth Clinic) and continue to be involved in lecturing and research into injury management and prevention. It will be cold this weekend in York so warm up well! On our YouTube channel you will also find lots of great free advice on injury management and prevention as well as Bikefit and getting the most out of your cycling experience .